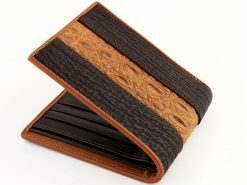 These tough leather wallets in a malt brown include a tan ostrich skin interior and are one of our top selling wallets. This skin is from the tail of this majestic beast which has arguably some of the most intricate and fascinating patterns. Add to that the combo of a contrasting tan interior and you’ve got a one of a kind croc wallet that’ll turn heads. Ever been hassled in the street or had someone try and steal your wallet? Well when they get a look at this “bad boy” they might have think twice about messing with you. Carry it around and show it off because it ain’t gonna work in your back pocket. This wallet is tough and very well made. I love the quality. I’m sure this wallet will last a lifetime, but it is also evil and will kill the pockets on all of your pants. Quality material; excellent craftsmanship. Probably the best wallet that I have ever owned.